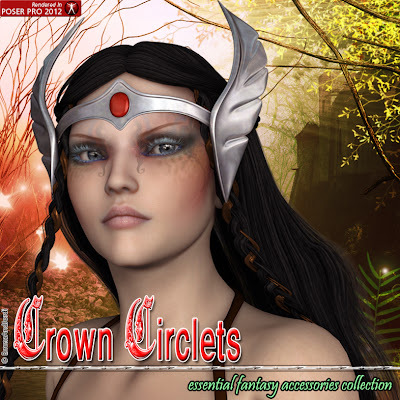 Our new product: Crown Circlets are the essential fantasy accessories set for your warriors, princess, valkyries, elves, and all kinds of fantasy characters... A must-have! All details in these crown circlets are carefully sculpted in 3D (they not textures, they are modeled), so you can render them from any point of view and get perfect renders. Be sure to check also all our jewelry. Because of lack of time I couldn’t post it all here. These props are for Victoria 4, but can be used with another figure (example: Genesis) using the scale and translate dials to put them in their heads. They're 30% off through May 2nd!